I’ve been hemming and hawing about what vehicle I will get to replace both my BMW 135is and Jeep Grand Cherokee as my year-round car. 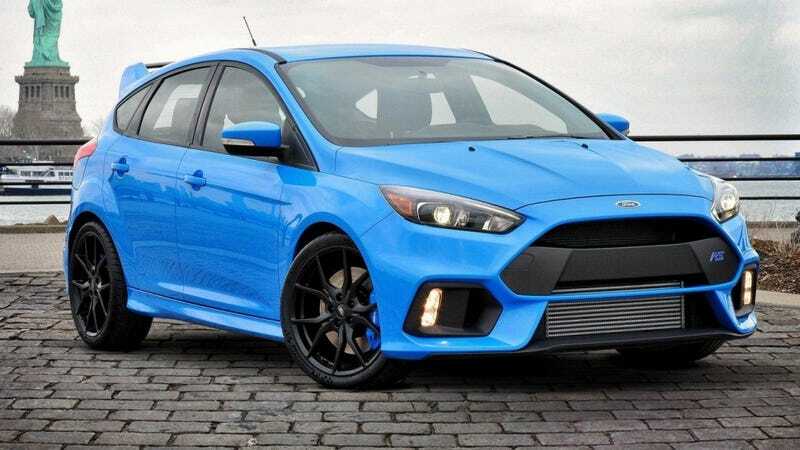 I know I want it to be fast and awd, so I thought, “hey, the Focus RS is coming out soon, I should find out about that.” Then I called my local Ford dealer(s). The first Ford dealer I called said they were getting one and only one Focus RS for the foreseeable future, and it has already been bought. They said that as far as they know, all the Ford dealers around here (Madison, WI) are getting only one car. Then I called the other Ford dealer near me and asked about the Focus RS. They are also getting one and only one car, and it hasn’t been sold yet. I half-jokingly asked if they were going to offer any kind of discount on it, and they said that it’ll probably sell for sticker, unlike the Shelby GT350 Mustangs which they are selling at a markup. I’m still halfway interested, but really while I often always get the fanciest version of a car, so the Focus RS is right up my alley, I also have a strong hatred of paying full sticker price for a new model of car just because it’s new. So here, I have a fun idea: call your local Ford dealer(s) and find out how many Focus RSes they’re getting. Whoever finds the dealer getting the most Focus RSes wins the prize, and the prize is nothing.